Paperproducts Design Party On coasters are perfect for your next party or for everyday use. 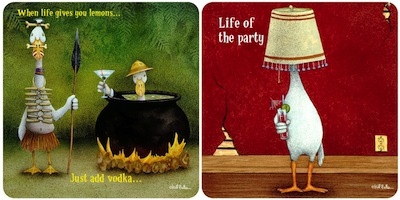 One coaster design features a duck holding a cocktail with a lampshade on his head and the message reads, "Life of the party." The other coaster design shows a duck standing next to a cauldron holding a spear while the other duck sits in the boiling cauldron holding a cocktail and the message reads, "When life gives you lemons, make lemonade." Humorous designs created by Will Bullas. Includes two coasters of each design. Boxed set of 4. Coasters measure 4.13-inch square. Hardboard with cork back.